Occurrence of aortopulmonary window (APW) in a setting of single ventricle physiology is very rare and its management requires overcoming specific technical challenges. We describe a child with large APW with a single ventricle who underwent division of APW, direct closure of aortic defect, reconstruction of main pulmonary artery (MPA), and pulmonary artery (PA) banding as a first stage palliation. A 3-month-old male child (weight 3.3 kg) presented with signs of heart failure. 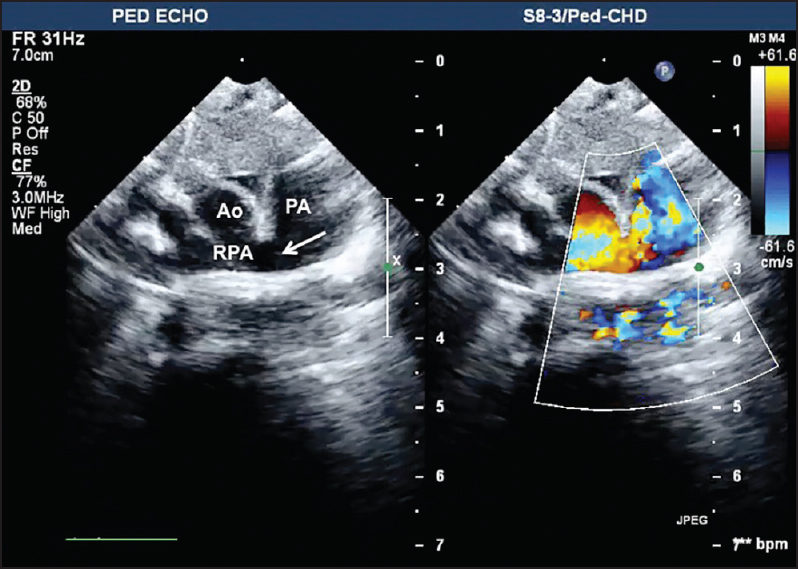 Transthoracic echocardiography revealed large APW (type III), large ventricular septal defect (VSD) involving the posterior, inlet, membranous, and mid-muscular interventricular septum (IVS), normally related great vessels and bilateral confluent, and large pulmonary arteries with severe PA hypertension [Figure 1] and [Figure 2]. The child was taken up for division of APW and PA banding as a first stage surgery through median sternotomy. After partially excising the thymus, a patch of pericardium was harvested. We noticed that there was a large APW, large and tense MPA, and 5 mm ductus. Both pulmonary arterial branches and APW were looped after dissecting the MPA and the aorta. The proximal extent was very near to the aortic root and was adjacent to the origin of the left coronary ostium. The distal extent was beyond the origin of the right pulmonary artery (RPA). Cardiopulmonary bypass (CPB) was established by aortic and right atrial cannulation. Both branch pulmonary arteries were snared and snugged. Remaining procedure was performed under moderate hypothermia. The ductus was transfixed and divided. Ascending aorta was looped proximally and distally to the APW. The APW was then directly clamped. A separate stab incision near the left pulmonary artery (LPA) origin was made so as to vent the PA and then APW was divided. The aortic end was sutured in two layers using fine polypropylene sutures. The clamp was released and hemostasis confirmed. 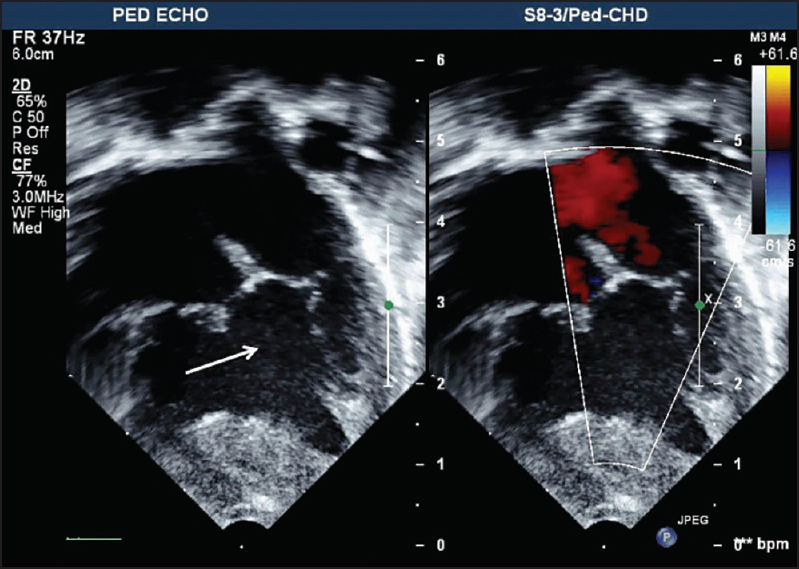 Defect in the PA was reconstructed with a pretreated autologous pericardial patch. The stab incision was closed using polypropylene suture. After rewarming, bypass was discontinued. An umbilical catheter was placed in distal MPA for monitoring and MPA was then looped. A band (4mm wide polytetrafluoroethylene strip) was placed around the PA. The band was gradually tightened until the 26 mm mark (on the basis of Trusler's formula) and anchored to the adventitia of MPA. The PA pressure distal to the band fell to one-third systemic pressures and oxygen saturation remained 100% on controlled ventilation. The child was extubated after 24 h of ventilation and was shifted out of the intensive care unit on the third postoperative day. Postoperative echocardiography showed a gradient of 60mm of Hg across the band and normal ventricular function [Figure 3]. He was discharged on the ninth postoperative day. On follow-up, the child had gained 500 gm in a month after surgery. The child now awaits stage II palliation, i.e., the cavopulmonary shunt. APW is an uncommon anomaly, occurring in less than 1% of all patients with congenital heart disease. Commonly associated congenital heart defects (in 52% of cases) with APW are anomalous origin of a coronary artery from the PA, interrupted aortic arch Type A and coarctation of the aorta. Except for one case report of APW with tricuspid atresia, no other literature has described this unique association of APW with single ventricle physiology. Embyologically, the IVS develops as a contribution of muscular septal growth from the floor of developing common ventricle, the membranous septum from endocardial cushion, and bulbar septum from the aortopulmonary septum above. This aortopulmonary septum is the one that septates the truncus into the aorta and the MPA. In our case, both developments — IVS as well as aortopulmonary septation — did not occur. It is not clear whether this embryopathy is a result of one event or both events occurring at the same time. Mori classified APW into three types. Type I or proximal: The communication is usually rounded and located above the semilunar valves, between the ascending aorta and the pulmonary trunk. Type II or distal: The defect, in a spiral curve, involves the pulmonary bifurcation at the level of RPA. Type III is characterized by total absence of the aortopulmonary septum resulting from the combination of proximal and distal defects, simulating a common truncus arteriosus. Richardson classified APW as Type I — Typical circular defect midway between aortic annulus and pulmonary bifurcation. 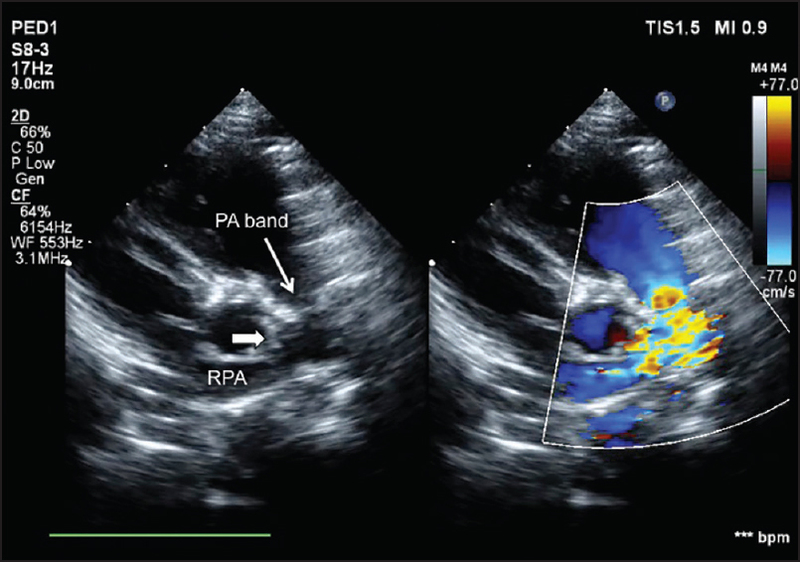 Type II — More cephalad defect between ascending aorta and the origin of the RPA. Type III — With anomalous origin of the RPA from the ascending aorta. Our child had a large defect of Type III while the RPA was originating partly from the APW as well. Commonly preferred approaches for repair of the APW are patch closure of the defect either transaortic or transpulmonary. Johansson's approach is another simpler way of accomplishing the same. Division and suturing of the defect though reported, is a less preferred technique. We routinely loop and divide the window on bypass without clamping the aorta. The aortic end is sutured off while the defect in the MPA is repaired with a pericardial patch. This eliminates residual leaks after surgery. In addition, PA contour is restored. In both the conventional approaches, the heart has to be arrested by administrating cardioplegia. We did not prefer causing cold ischemia for a heart that was about to be subjected to PA banding for the fear of early ventricular dysfunction. Banding would become technically difficult and next to impossible if the window is to be interrupted with any of the conventional procedures. In addition, it would put the suture line inside the aorta under tension after PA banding, resulting in leakages from the patch or even a patch dehiscence. Additionally, during the next stage surgeries, looping the aorta would become extremely hazardous as the window would still be intact from outside. Later, dividing the MPA at the time of Fontan completion would pose an additional hazard. Our objective was to divide the window without employing cardioplegic arrest. Hence, we achieved a great deal of dissection of the window without bypass. After this, we looped the window and then divided it on bypass. By doing so, we eliminated most of the complexities and challenges of doing PA banding. In addition, we minimized the risk of future stages of surgeries as well. One case report describes the management of neonatal APW with tricuspid atresia without the use of CPB. But this is possible in a proximal type of APW. In cases of Type III APW such as the one in our report, where the communication extends spirally over the RPA and the posterior aspect of ascending aorta, significant dissection and manipulation is required that can be safely done only on CPB. Thus, our surgical approach for this rare case of large APW with a single ventricle was successful with minimal CPB time. In addition, it avoided the cold ischemic arrest, thereby, improving recovery after PA banding. In addition, this technique probably minimized the hazardous dissection during future staged surgeries. Soares AM, Atik E, Cortêz TM, Albuquerque AM, Castro CP, Barbero-Marcial M, et al. Aortopulmonary window. Clinical and surgical assessment of 18 cases. Arq Bras Cardiol 1999;73:59-74. Kutsche LM, Van Meirop LH. Anatomy and pathogenesis of aorticopulmonary septal defect. Am J Cardiol 1987;59:443-7. Peer SM, Donofrio MT, Gaur L, Sinha P. Tricuspid atresia with aortopulmonary window: Challenges in achieving a balanced circulation. Interact Cardiovasc Thorac Surg 2013;17:441-3. Mori K, Ando M, Takao A, Ishikawa S, Imai Y. Distal type of aortopulmonary window. Report of 4 cases. Br Heart J 1978;40:681-9. Richardson JV, Doty DB, Rossi NP, Ehrenhaft JL. The spectrum of anomalies of aortopulmonary septation. J Thorac Cardiovasc Surg 1979;78:21-7. Johansson L, Michaelsonn M, Westerholm CJ, Aberg T. Aortopulmonary window: A new operative approach. Ann Thorac Surg 1978;25:564-7.